It is with great sadness and heavy hearts that we announce the passing of our beloved Darrell on Saturday, January 19, 2019 at the age of 58 at Pinawa Hospital. It is with great sadness and heavy hearts that we announce the passing of our beloved Darrell J. Adamik, peacefully on Saturday January 19th, 2019, at the age of 58, with his daughter Tara by his side following a courageous battle with cancer and pulmonary fibrosis. Darrell will be forever missed by his loving wife, Brenda, his daughter Tara, granddaughter Peyton, stepson Trevor (Eileen), grandsons Malcolm, and Zachary, stepson Derek (Breanne), mother Helen, sisters Cheryl and Val, brothers Brian (Helen) and Pat (Brenda), mother in-law Daisy, as well as several aunts, uncles, nieces, nephews, great nephews, countless friends and his faithful companions Bruno and Rocky. Darrell was predeceased by his father Paul Adamik in 1995. Darrell was born in Winnipeg in 1960 and although he grew up in the west end, his favourite place spent as a child was at his grandparent’s farm where he developed an everlasting bond with his uncle Ed. Darrell began his career with Bristol Aerospace in 1979, where he was a dedicated employee and developed many lifelong friendships. 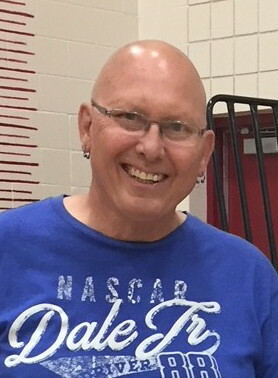 Darrell had many passions; he enjoyed road trips and driving the road to the sun, he loved spending time outdoors; gardening, camping and snowmobiling and he took great pride in decorating for Halloween and Christmas, with Christmas being his favourite holiday because it was time spent with family. Darrell loved watching hockey and he was a huge NASCAR fan, with Sundays at his house known as race day. Darrell was a kind hearted, caring and loving man who always put others before himself. He was a true perfectionist. He had admirable strength and determination and a love for his family which was undeniable; it was his greatest joy. He was an amazing man in every way. The family extends a heartfelt thank you to Dr. Kidane, Dr. Bruneau and all the nurses at Cancer Care and Pinawa Hospital. A special thank you to Carmina. To my Dadio, you were the most amazing father and grampa-pa to Peyton. We had a bond unlike no other and I will forever miss you. Your wings were ready but our hearts were not. Heaven has gained a true angel. As per Darrell’s request, there is no service. A celebration of life will occur at a later date. In Memory, donations can be made to the Lung Association of Manitoba or Cancer Care Manitoba. Our heartfelt condolences to Brenda and family . If you’re in need of a ear or anything we are just down the road. Our thoughts and prayers go out to you. Brenda and family: So sad to hear of your loss. Darrell was taken from you way too soon. Please accept our sincere condolences. You were Darrell’s girls! The unconditional love he had for you Tara, was something few will ever experience. That love grew, and if possible, blossomed even bigger with the birth of Peyton! May the many happy memories you have of your Dadio keep you smiling through the tears and comforted when you are lonely. You will always be Daddy’s Little Girl! My deepest condolences to Tara and her family. So sorry for your loss. My thoughts are with you. Dear Helen, Cheryl, Val, Brian Patrick, & family. It was just the other day that Darrell came to my mind in a brief memory of childhood. Today I read of his passing and feel the heartache and sorrow of his family. I have many fond memories of Darrell that I will forever cherish. To Tara , your father and I grew up together on Alverstone St. , attended school and even had our first communion together. I still have that picture. Helen,Val, Cheryl, Patrick, Brian, Brenda, Brenda,Tara, and Peyton, and related families. remain etched in the minds of all who knew him and for certain in ours. his Lord and Savior in Paradise. God Bless all.